Why there are so many negative comments about Driver Support? How is it possible that program gets inside the computer without my knowledge? How to remove Driver Support? 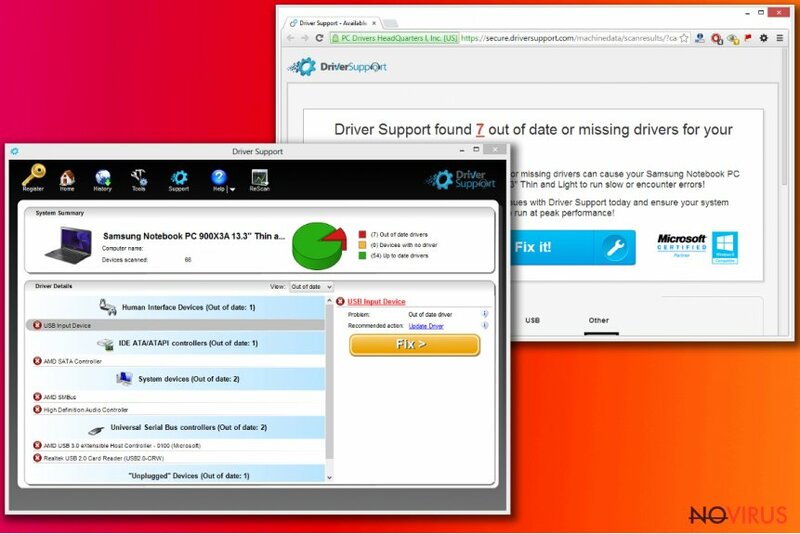 Driver Support is a legitimate program created by PC Drivers HeadQuarters. 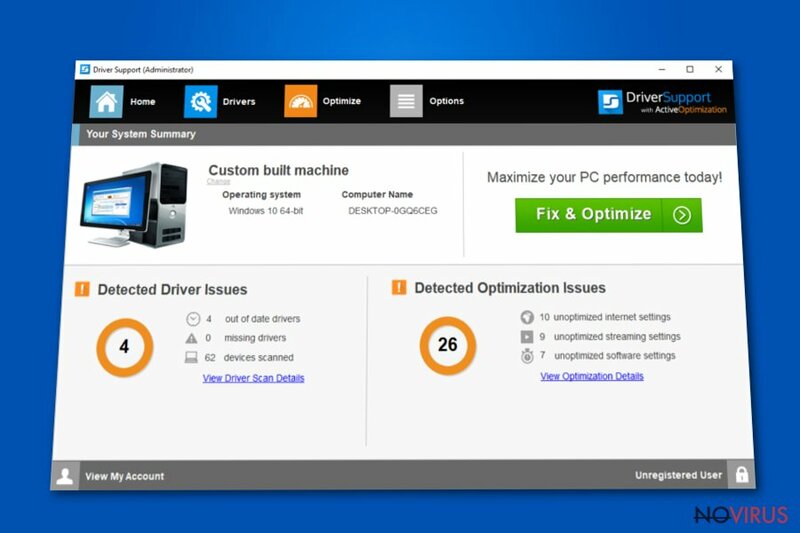 This tool is supposed to diagnose and repair various computer issues and optimise computer’s performance. Once you install this program, it starts scanning a computer and looking for errors, such as outdated or broken drivers. After the scan users receive the list of errors and, in order to fix them, they have to purchase a full version of Driver Support. In this article, we won’t analyse this program and won’t provide our opinion about its effectiveness. However, we have some concerns about its distribution methods that have been bothering many computer users. This program has an official website that offers to download it. Though, users complain that they haven’t done it and the program still appeared on their computers. Indeed, this program might spread bundled with freeware or shareware. Once it shows up, it starts bothering computer users with annoying advertisements and users start looking for removal solutions. At the end of this article, you will find a quick guide how to remove Driver Support from the computer. We already told you that this program is not a virus and cannot damage your computer’s system, personal files or cause other problems. Well, computer users claim that as soon as program appeared on their computers, they started receiving annoying Driver Support ads. Besides, program’s distribution method is also questionable. It’s hard to trust a program that uses the same distribution techniques as potentially unwanted programs. It sneaks inside the computer without user’s knowledge when he or she installs a necessary program. In our opinion, if you started seeing ads by Driver Support and you haven’t installed the program, you should remove it immediately. There’s no need to keep a useless program on your PC that keeps bothering you with advertisements. Do not hesitate and initiate Driver Support removal. Driver Support is a legitimate program that has an official website from where users can download the program. The program is also promoted on various websites that offer free downloads. However, this tool is distributed using additional and quite shady methods as well. It spreads bundled with freeware and shareware. Every time you download and install software from questionable sources, you risk installing an unwanted program. The majority of users opt for ‘Quick’ or ‘Basic’ installation mode. If they choose this setup, they allow installing additional programs. Keep in mind that software installers do not openly disclose about optional programs. For this reason, it’s important to opt for ‘Advanced’ or ‘Manual’ settings and monitor installation process. During the installation, there will be a checkbox with various applications. Deselect all of them. These apps, tools or plugins are nothing else just potentially unwanted programs. Go to Start, then go to Control Panel, and click Uninstall a Program. Look for Driver Support in the section Add/Remove Programs/Uninstall a Program. Once you find the program, click Uninstall and save the changes by clicking OK. Moreover, we recommend scanning the computer with a reputable anti-malware/anti-spyware program such as Reimage or Malwarebytes MalwarebytesCombo Cleaner. Then you can be sure that no suspicious programs are not left on your computer. Besides, this security program will protect your computer from the various infections in the future. Malwarebytes is recommended to remove virus damage. Malwarebytes scans the entire computer system and checks whether it is infected with spyware/malware or not. 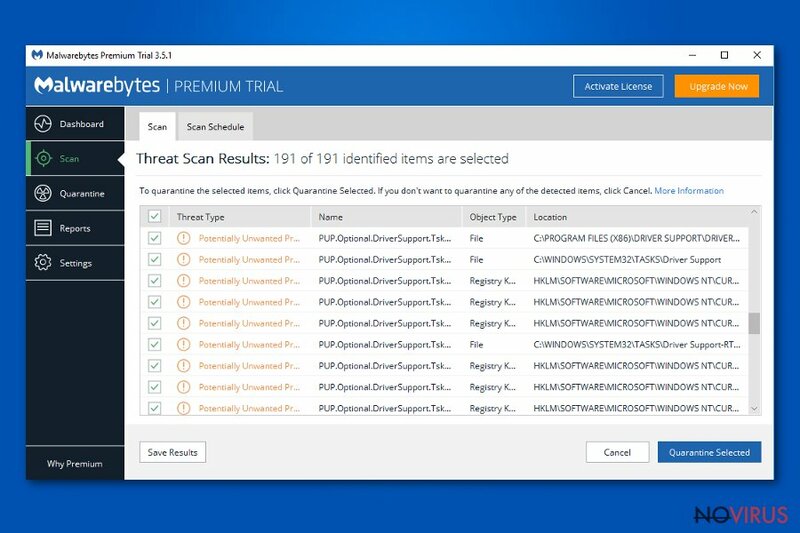 If you want to remove computer threats and secure your computer system, you should consider buying the licensed version of Malwarebytes. Now, take a look at the list of programs and find Driver Support or other programs that you do not remember installing. Wait until you see Applications folder and look for Driver Support or any other suspicious programs on it. Now right click on every of such entries and select Move to Trash. Manage Add-ons window will appear on your screen. Now, search for Driver Support and other questionable browser add-ons. Right-click them on each of them and select Disable. A new window appears, and then you have to tick Delete personal settings and click Reset to finalise Driver Support removal. After completing these steps, Microsoft Edge should be Driver Support-free. Now, locate Driver Support and other suspicious extensions. Click Remove to eliminate them. Reset Firefox to its default state message should appear then. You will see Reset Firefox button. Click this button a few times and finalise Driver Support removal. Now, look for Driver Support and other suspicious extensions and then click the trash icon to remove them. Click Reset to approve this action and finish Driver Support removal. Here, select Extensions and look for Driver Support or other suspicious entries. Click on the Uninstall button to get rid each of them. Now you will see a detailed dialog window filled with reset options. All of those options are usually checked, but you can specify which of them you want to reset. Click the Reset button to complete Driver Support removal process. This post was published on 2019-04-01 at 02:49. Category: System tools, Viruses. You can quickly scan the QR code with your mobile device and have Driver Support manual removal instructions right in your pocket. What method did you use to remove Driver Support?